As I am typing this, the sun is playing hide and seek with the clouds, and me. Some snow flurries were chased away by the wind this morning and the rain didn’t stop chasing my dreams away last night. February is on its way. Still, yesterday was a better day. Yesterdays seem to always be better than today. We had a warmer breeze and a heavy, cloudy sky. We were able to go out, leaving behind our hats, our furry boots and winter gloves. We went for a stroll to the downtown bakery, said Hi to the old lady and went exploring the bookstore for a new nighttime story. Lunch was made of wiggly linguine and coriander roasted butternut squash, my daughter’s favorite. While dinner was a dive into the fridge, rescuing what was supposed to be a Savoy cabbage. It was tucked away, forgotten between the crunchy bunch of spinach and the red lettuce. Here was my green cabbage, waiting for its time to come, for my hands to pull it away from the cold crisper and for my newly sharpened knife to…Oh! I’ll spare you the details. Although this time I didn’t have to use my knife, as I nearly cut my index off the other day chopping some onions. I should go back to the butter knife days. Those were safer days! My cabbage waiting for me on the countertop, I started taking care of my ground beef filling by adding to it some cumin, a dash of cinnamon, herbs, garlic and other seasonings. 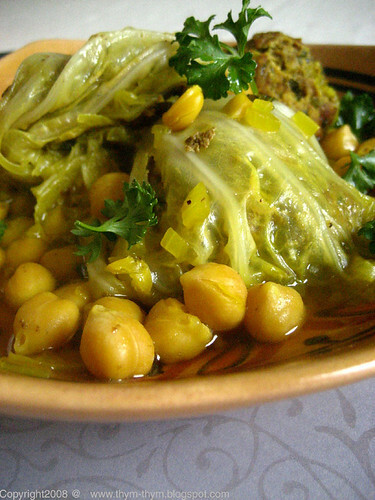 The cabbage leaves were gently peeled, cleaned, filled and carefully nestled under the chickpeas, in a yellow, soothing river. How I wish I could swim in it. Stuffed Cabbage Tagine is the way my mother had us eating cabbage when we were kids. And trust me, it was very hard not to love it in this dish. We would lick the plate and ask for more. It’s so easy to make, I had my hubby making a good part of it while I was getting my daughter ready for bed. Don’t get me wrong; he can be a fine cook. When he wants to. You don’t have to own a Tagine to make this dish; just a good pan will do the trick. The beautiful yellow color of the broth is due the use of Turmeric, also known as the saffron of the poor man. I used overnight-soaked chickpeas that I added at the beginning of the cooking, but if you have ready, canned chickpeas, let them cook in the pan during the last ten minutes before serving. To enjoy this Tagine plentifully, you will need a good portion of crusty bread to mop up the broth, and a bar of soap to clean your turmeric colored nails. Yesterday was indeed a colorful day. - 1 square of bread, soaked in a little bit of milk, then drained. Carefully peel the leaves of the cabbage. Wipe them with a clean towel, remove the hard stem and set aside. In a pan, heat the oil, add half the onion and cook over a medium heat until transparent but not caramelized. Add the garlic finely chopped, ¼ tsp of ground cinnamon, the turmeric and the chickpeas. Cover with water and bring to a gentle boil. Season lightly with salt and pepper. Prepare the filling: Mix the ground beef with the remaining chopped onion, the remaining chopped garlic, parsley, egg, bread, cumin, Ras El Hanout, a dash of ground cinnamon, salt, ground black pepper, and mix without “kneading” the meat. Fill each center of the cabbage leaf with the filling and fold as you would fold a letter. Seal with a toothpick. You can turn some filling left into meatballs (like in the picture) and let them cook in the broth. Nestle the cabbage packages tightly under the chickpeas, add the meatballs, if any, cover and simmer on a medium low heat for 30-45 min, or until the chickpeas are fork tender and the meat is cooked all the way through. Uncover, and let the broth thickens until it becomes slightly syrupy. Season to taste then carefully remove the toothpicks. Serve generously sprinkled with parsley. - 50g de pois-chiches, trempées la veille ou en conserve. Eplucher délicatement le chou. Netoyer ses feuilles avec un torchon propre, enlever la tige épaisse du milieu et mettre de coté. Faites chauffer un peu d’huile dans une poele. Ajouter la moitié des oigons et faites suer sur feu doux sans les caraméliser. Ajouter une gousse d’ail hachée, les pois chiche, curcuma, et couvrir d’eau. Assaisonner legerement de sel, poivre et porter a ébullition. D’autre part, mélanger la viande avec le reste de l’oignon, ail, persil, le jaune, le pain, cumin, une pincée de canelle, sel, poivre. Mélanger mais sand “pétrir” le tout. Remplir chaque feuille de chou de la farce et fermer comme si vous fermez une envelope. Fermer avec des cure-dents. Vous pouvez untiliser le reste de viande comme des boulettes (voir photo). Ajouter les envelopes de choux a la sauce et le boulettes de viands, si vous souhaiter en mettre. Fermer et laisser cuire a feu doux pendant 30-45 minutes, jusqu’a ce que les pois-chiches soient cuites et la viande aussi. Decouvrir et laisser la sauce réduire en une sauce épaisse. Retirer les cure-dents et servir avec du persil haché, généreusement parsemé sur le dessus. Warda - this looks so great! I would love to try it. 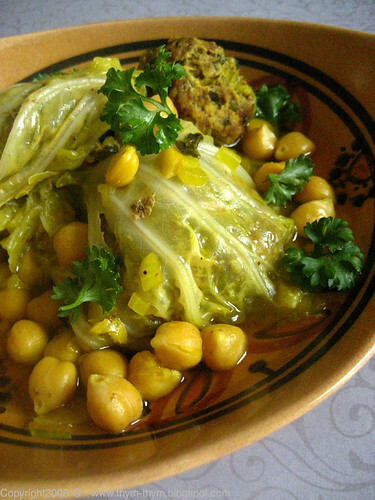 Love cabbage and chickpeas. Ooooh, another wonderful tagine recipe -- you know I will not be able to resist trying this in my tagine! This brings a funny memory. I remember going to my niece's wedding in the Auvergne region of France and the delicacy is Chou farci. We ordered it thinking it would be like my mother's. We were very disappointed indeed! Your recipe is exactly how she served it. I think it was called "Kromb mahshi." in Eastern Algeria. - Mom, thank you very much. Next time we get together, we will have an Algerian party at my place. I don't know if there will be Stuffed cabbage tagine, but there will be a tagine for sure. - Lydia, I knew you would like it! And your tagine is simply beautiful. Hope you will enjoy it my friend. - Krimo, that is so funny! I am sure your mother's Kromb Mahshi was even better than mine! I know, even though this is how my mother serves it, I can never get it to taste like hers. Colorful indeed! I bet it was as lovely as your post. Your writing is lyrical. I love reading your posts and can't wait to try this out in my own small kitchen. -Kristen, it was delicious. Thanks for your note. -anonymous, thank you very much. It means a lot to me! Hope you will enjoy it!